It's been almost ten years since I received my Albion Hospitaller, and it's still a lovely piece. However, over the years I've noticed that I can't perform test cuts or whatever other swinging without the pommel catching a little on my pisiform bone in my wrist and, frankly, annoying the hell out of me. Gloves mitigate this somewhat, but I much prefer the feeling I get with bare hands. Rather than sell the sword or send it back to Albion for some kind of re-shaping which might not even fix the problem, I think the best option might be to tackle it myself with different grades of abrasive paper and, maybe, a small file. 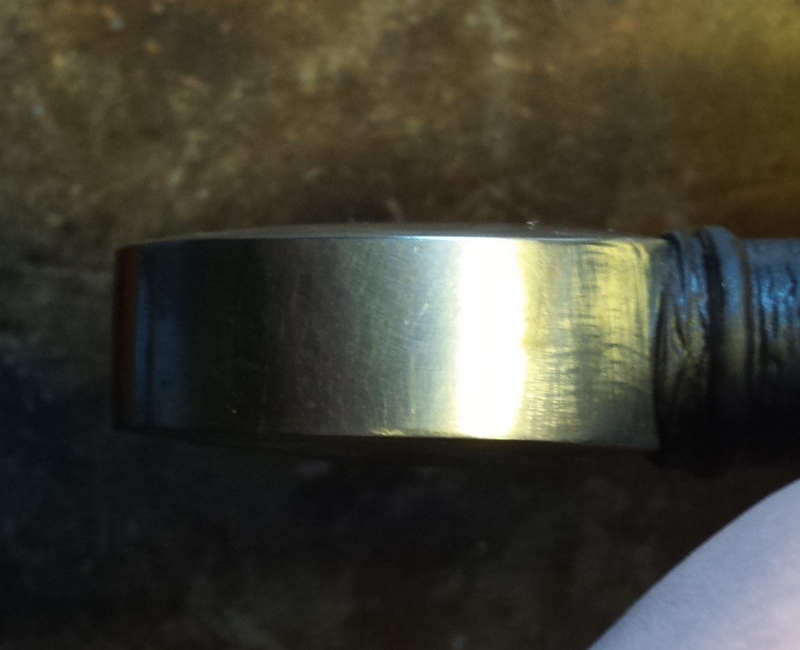 Notice that the pommel is thicker at the top than the bottom (the top being the side that rubs against my hand). This, I think, is the first problem, and probably the most difficult one to tackle. The second problem is that the corners of the pommel are quite pronounced, being nearly 90 degrees, and I am sure that I'd be able to round those off and make the angle a little more oblique with a few dozen strokes of a file and some abrasive paper. However, I'm not really sure which option is best. Should I send it back to Albion? I doubt they'd have to do more than replace the grip to get to the top part of the pommel, but without my hand there to compare it to, I don't know how many trips it might need to take. Should I fix it delicately, with the paper etc as outlined above? Should I go more aggressive, taking the grips off, getting out a coarse-toothed file and really going to town on it? What is your grip like when your swing? Some pommels are designed to be sadistically painfully if not gripped correctly while swinging. It's essentially what I show above, the "handshake grip", by my understanding. I've held it in a "hammer grip" but the problem is actually slightly worse with that. Have you tried wearing gloves or sleeves long enough to cover your wrist when wielding the sword? That might extend you a layer of padding. That said, if you must modify it, the only thing I would recommend is rounding off the arrises (corners). That won't change the weight distribution appreciably. A more extreme modification to remove a chunk of the pommel may be more comfortable, but would take some time to execute and would be an aesthetic issue. I'd start with simply chamfering the edges, a 45 degree bevel maybe 2 or 3mm wide and deep all the way around the disk on both sides (just make sure it's even and uniform; marking the future edges of the bevel with a permanent marker before you start filing helps). That might well be enough to stop it from catching on the bone. Shape with a file, polish with papers. Before you alter your sword, I would recommend playing around with your grip a bit more. By subtly altering your grip, you can modify the placement of the pommel, and probably prevent it from catching on the bone in your wrist. Try, for instance, to have the face of the pommel placed against the various muscles in your hand just above the pisiform bone- along the abductor digiti minimi and flexor digiti minimi brevis. It should be possible to still grip your sword and no longer have pommel hit the bone. I have a St. Anastasie bronze sword by Neil Burridge, and if you’ve ever seen the pommel on it, you’ll know it’s like a nightmarishly wide brazil nut pommel. I say “nightmarishly” because it is extremely easy to have it dig into your wrist or forearm. It was only by fiddling with my grip that I was able to find a way that still allowed me to strike comfortably--without having to alter the pommel. The grip is way too long. You shouldn't be able to grip it with your whole hand and still have that much space. 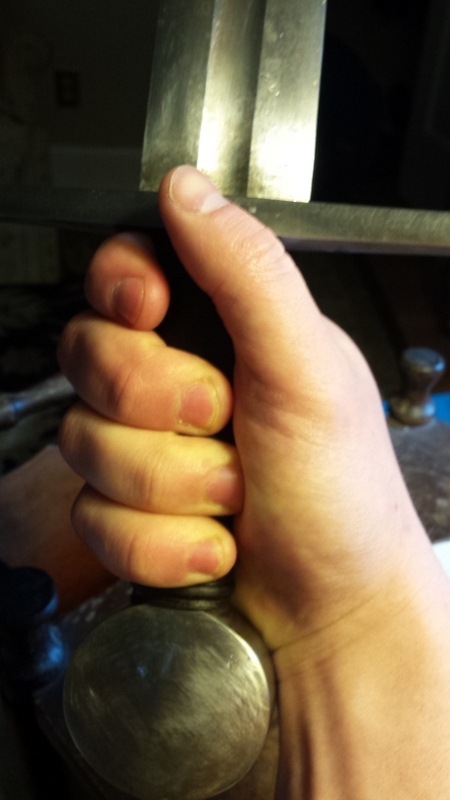 9-10 centimeters are just fine, the pommel is supposed to be supporting your hand (with your pinky around it). So you know more than a team of swordsmiths and researchers, eh? Do you have the sword in question, by the same company, or have seen the example which they base this sword off of? For a full-on handshake grip like that, you need to slide your hand further towards the pommel. 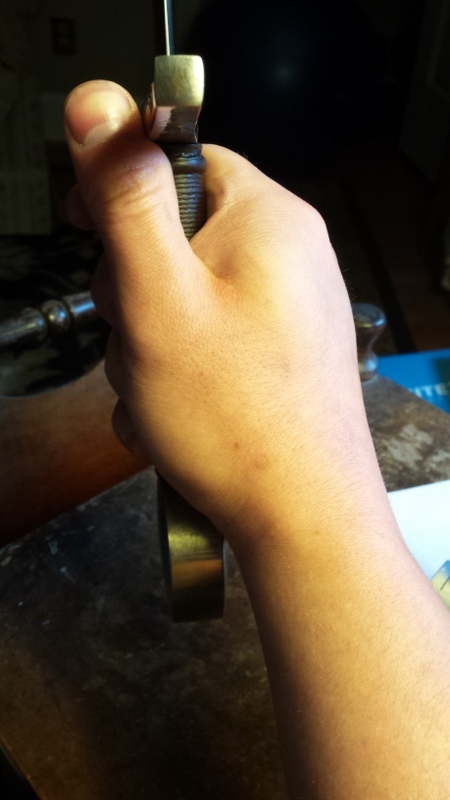 The top part of the pommel shouldn't be rubbing against your wrist -- it should be nestled in your palm. The way you're gripping it isn't ahistorical either -- I'm pretty sure I can dig up a picture or two depicting something similar given enough time. But it's not Peter Johnsson's "handshake." I noticed the difference since I've started training my left hand with one-handed swords too lately and I find that it tends to slip into this kind of grip because my left hand and arm doesn't quite have the strength and the muscle memory to hold the grip in the light-but-firm manner I can normally expect myself to manage with the right hand. The pommel gets in the way with the left hand but not with the right, which means I can be pretty sure that I'm gripping the sword wrong with the left. That'd be true for an earlier sword like the Albion Bayeux, but by the Hospitaller's time grips were getting longer. It's not really about the grip being too long in this case -- it's more about Alexander gripping the sword in the wrong place for a "handshake" grip. Sorry for my delayed reply folks, I've been giving this a lot of thought. While I appreciate your advice, Lafayette's response in particular caught my eye. I've given this a shot, as well as a few other styles of grip, and it does actually feel better. I'd still want to round the corners to make it just a touch more comfortable, but it's definitely an improvement. That said, it puts my fingers too far away from the guard for my liking. Now this gives me something else to think about. I was under the impression this sword could represent c. 1100 rather than the 1200-1299 dating of the original, but I unaware of any grip length difference between the two periods. Measuring it, the grip clocks in at 4 inches, give or take 1/16th of an inch. So not the 3 3/4 listed for the Reeve and Norman in the Reviews section, but also not the 4 1/4 listed for the Knight and Ritter. This makes me wonder if it might be worth my time to have it re-sized, even down to something as short as the 3 5/8 listed for the Clontarf. I'd want to rough it out in wood first, to test the feel, but it's one more thing to muse over. That's another diagnostic characteristic of the Peter Johnsson "handshake" grip -- it does leave some space between the hand and the cross, and I think that's pretty intentional. If you look at Roland Warzecha's videos (since he's one of the most vehement advocates for the handshake grip) it's pretty easy to spot the gap between the cross and his hand, although sometimes it's obscured by the fact that he often extends his thumb along either the flat or the back (the part corresponding to the false edge) of the grip. Of course, that being said, it's not the only legitimate way to grip a one-handed medieval European sword, and you're under no obligation to adopt it if you prefer to grip the sword closer to the cross. After all, it's your sword and it's your hand gripping it, not any of ours. That's because the change was pretty gradual, and we only start seeing a noticeable jump to a longer grip length when types XIIa and XIII/XIIIa came around. He describes the pinky helping to lock the grip in place, and I think that may be part of my problem, as with a wheel pommel there is nothing to lock against. His grip also seems more secure than mine overall in the handshake grip, and although his thumb might not reach the guards of the swords, his pointer finger certainly seems to. That, for me, is simply not achievable with the Hospitaller. I can hold it with a hammer grip, and by moving my thumb up over the cross guard or onto the blade it becomes relatively comfortable. I think with some chamfering of the pommel that would be the most comfortable overall. However, I ultimately want this sword to plausibly represent an example from from ca. 1075-1135. The Royal Armouries sword on which it is based, on the other hand, is dated to the early 13th c. This brings us to Addison's post. The only thing that leads me down that path is concern for historicity. If I were to try to get it modified I would probably also ask to replace the wheel pommel with one of the brazil nut types like on the Reeve or the Søborg. It certainly would not be cheap, but would I think be more cost-effective than selling the Hospitaller and replacing it. If you want to have the pommel lock into your hand (which is one viable way to wield a sword), you can do this fine with a wheel pommel simply by moving the hand a little further down towards the pommel. Get the ring ringer roughly to the area where the pommel transitions to the grip, and then grip onto the pommel more directly with the little finger. Obviously, this can be uncomfortable depending on the exact layout of your pommel, grip, gloves, what calluses you've developed, and so on. But it works just fine with pretty much any pommel that's quite a bit wider where it joins the grip - wheels, brazil-nut/tea-cosy style, and so on. Maybe somebody with a Gaddhjalt would trade with you? The Gaddhjalt and the Hospitaller are quite different in terms of handling. The former has more authority in the cut, but the stroke recovery isn't as quick, and overall it seems a slightly less 'agile' sword, I think. The grip on the Hospitaller feels appropriate to me, whereas I actually would prefer the Gaddhjalt's grip to be a touch shorter, to better control the hefty blade presence and bring a bit more snap to the cuts, which I feel it is perfectly capable of, if somewhat more difficult to pull off (compared to the Hospitaller). There's another, more experiential way to learn to use a Viking or high medieval sword with a difficult pommel. Once learning the proper hammer and handshake grips, loosen up a bit and allow the hand to naturally transition through different grips for different positions. Don't think about it, just practice drills for an hour a day with just that one sword. Pain is an excellent teacher and will tell you which positions are wrong without even looking. After about a month, the pain will magically go away as your cerebellum unconsciously adjusts your body motion to the sword. Unless the sword has an outright wrong design (unlikely for an Albion) this will work. I can hold it with a hammer grip, and by moving my thumb up over the cross guard or onto the blade it becomes relatively comfortable. I think with some chamfering of the pommel that would be the most comfortable overall. However, I ultimately want this sword to plausibly represent an example from from ca. 1075-1135. The Royal Armouries sword on which it is based, on the other hand, is dated to the early 13th c.
Interestingly, I'm pretty sure that Roland mentions elsewhere (though I don't exactly remember where) that the handling of the thickest sorts of disc pommels are greatly improved by chamfering the angle of the pommel where it meets the grip, so he probably would approve of the idea and wouldn't consider it entirely ahistorical. But remember, swing your sword in anger you should not, for that way lies the dark side.